You’re Ready to Quit Your Job. Now What? I have always found that the decision to quit your job is often more painful than the execution. It’s easy to spend days, weeks – maybe even months – convincing yourself it’s the right time, the right move, building up the confidence to make it happen, and playing out various scenarios and conversations in your head. It can also be easy to second-guess your decision once it comes down to formulating a plan to act on quitting your job. Your career is about you – and the decisions you make need to prioritize your growth and work towards your future-facing goals. After all, companies have entire departments dedicated to hiring, firing, retaining, and onboarding talent – because people move around in today’s job market more frequently than ever before. If nothing else, start by setting an end date based on when you want to leave or have a new opportunity. Then work backward from that date to create a plan of transition. Once you’ve set an end date to quit your job, it’s time to take action to ensure that your transition is a smooth one and that you leave on the best possible terms. Doing so will not only show respect for your employer, but it will most certainly benefit you in the long run and safeguard your reputation. Here are a few tips to prep yourself to give your notice, how to deliver it, and how to solidify those important relationships on your way out. 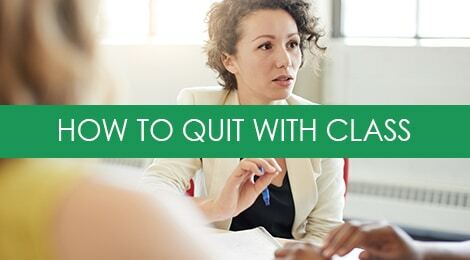 STEP 1: Make a list of people who will be impacted by your decision to quit your job, and determine how to make any necessary handoffs of client accounts, existing projects, or other tasks. Upon giving your notice (or when appropriate), ask your supervisor or HR representative about exact processes, timelines, and company policies for relinquishing your responsibilities and transitioning those aspects. STEP 2: Consider any customers or clients who need to be informed of your departure, in the interest of maintaining those relationships. Be cautious with this step, and always refer to your company policies to ensure that you don’t breach any non-disclosures or contractual terms. Ask how you should communicate this information to your clients or vendors. Once you’ve left the company – and if appropriate – consider connecting on LinkedIn. STEP 3: Resist the urge to speak publicly about either your new or former employer on social media. Doing so in an inappropriate manner (i.e. voicing your frustrations, discussing internal affairs) is not only unprofessional and likely to hurt your relationships – but it’s also grounds for rescinding a job offer, or worse – invoking a lawsuit. STEP 4: Either before or shortly after you leave the company, make sure you connect on LinkedIn with your peers, supervisors, and other colleagues with whom you have a positive relationship. Not only is it important to maintain these connections for potential opportunities down the line, but they can serve as key sources for referrals, references, and recommendations. Even if you didn’t list someone as a reference in this job search (you didn’t want them to know you were looking! ), you may need them to vouch for you the next time you find yourself in the market. Identify who those people will be and ask their permission in advance before years go by and you’ve lost touch. STEP 5: Consider the possibility of a counter-offer. It is not uncommon for companies to counter the offer an employee receives in the interest of retaining them. If your employer does counter, is it something you would consider – and if so – what would the offer have to look like to make it worth your while. If it’s more about the opportunity and personal satisfaction (read: no amount of money will make you stay), be prepared to thank them and walk away. You are under no obligation to reveal either the amount of your new offer or the reason you prefer the new opportunity. You are not even obligated to reveal the new employer. And while it may seem like common sense, always avoid burning bridges whenever possible. Industry peers talk, and people move around. The actions you take today may very well impact your career trajectory down the line. Know your boundaries, rights, and responsibilities ahead of time so you are equipped to make the best decision, and take the best possible course of action to ensure a smooth transition. A solid resume is the key to marketing yourself and getting success out of a long-distance job search. Check out our suite of resume and branded content services. Tags: quitting, transition. Bookmark the permalink. Want to Ace the Job Interview? Come Prepared!